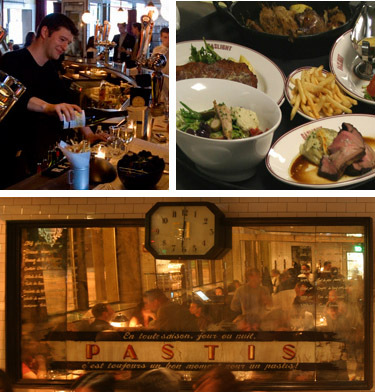 Named "Best Brasserie" by Boston Magazine in 2008, Gaslight, Brasserie du Coin, is a classic Parisian neighborhood brasserie in SoWa, Boston's newest dining destination. Gaslight offers guests French brasserie cuisine of impeccable quality and improbable value in an informal, old world-is-new-again setting. This quintessential brasserie features a handcrafted Parisian zinc bar, reclaimed wood floors, mosaic tiles, beamed wood ceilings, nicotine stained walls and antique mirrors. Guests choose from an eclectic mix of barstools, cafe tables, communal tables, booths and banquettes. Gaslight courts all aficionados of fine food, sophisticated cocktails and good times.